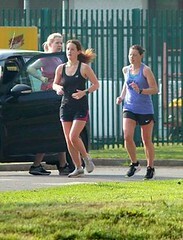 A total of 666 runners took part in the first BHAA evening race of the summer in Carrigtwohill last Wednesday evening. 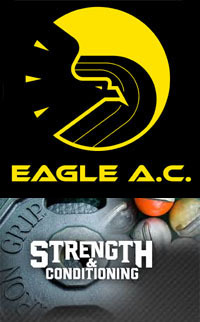 As club names are not listed in the results, it is not possible to list every Eagle AC participant. Below are some of the category prize winners. Well done to all who took part – there were some great times posted ! Well done to Joe Murphy who finished 12th overall in tough conditions on Saturday. 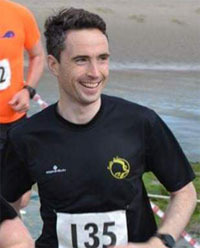 Congratulations to Cathal Twomey who was the first man home at the Bealtaine 5k in Union Hall on Monday. Well done to Ciaran who was the first across the line on Saturday morning. The Barrington’s hospital Great Limerick run took place on Bank holiday Sunday with the following Eagles taking part, well done to all. Alan O’Brien continued his great form with a PB 1:11:33 in the half taking 5th place overall and Ronan Boland was 3rd M45. 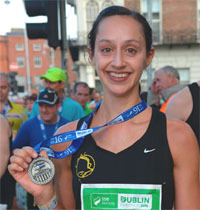 Congratulations to Maeve also taking on the full marathon on the day. This Half Marathon doubled up as the Munster HM road championships, team results will be available next week so we will update on any success in our next newsletter. 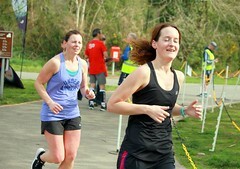 Apologies, we have heard of a couple of omissions from the 25k race last week. A super run for Tom Fox with a top ten finish and 1st in his category, and good running also by Denis Allen. 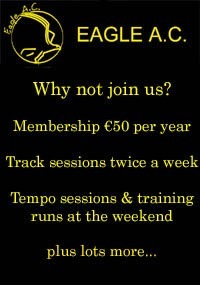 A good number of Eagle runners out for Ballintotis 4 Mile road race this year and some great times results. Congratulations to John O Callaghan 4th man home, Eileen O Callaghan, Richard Piotrowski, Sandra Manning, Ken Higgs, Frances O’Connor all category prize winners on the night. Well done to all running on the night. Two Eagle members took part in the 5k version of The Great Railway Run on Sunday Both taking podium positions Mairead was first lady home and Cathal was 3rd man home. Congratulations guys !!! 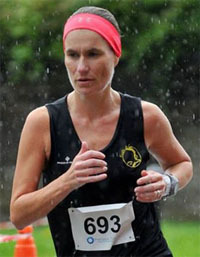 The BHAA Stryker 4 mile took place in Carrigtwohill. We will include these results in next week’s email as they are not yet up. Well done to all racing. Some impressive performances in the 5K and 10k tonight. In the 10k, both Colin O Herlihy (O45) and Joe Murphy (O60) won their categories. Top 10 performances by Karen Bevan and Helen McKenna also, both getting new PB’s tonight. Well done to all who took part! Clubs were not listed so apologies if I’ve missed anyone. The annual Great Railway run took place in good conditions last Sunday morning. No clubs are listed in the results but the following members have been spotted, with Colin O’Herlihy a top ten overall finisher in the 25K, while Andrew France both 1st place in their categories, and Frances took 1st place in her category in the 10k. Well done to the many Eagle runners out on the day, apologies if any names have been missed. Congratulations to Paul Cotter Dympna Connolly who seem to have been our only two representatives in London this year. A perfectly paced run saw Paul break the magic 3 hours in a fantastic 2:59:23. 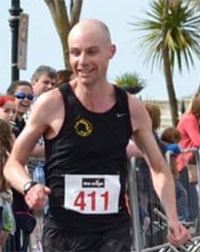 Well done to Darren Casey who took part in the Wexford Half Marathon last Sunday. He did it in a time of 1:28:55 a new PB! Congratulations Darren on a super race. 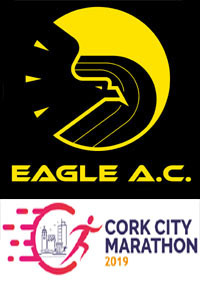 A total of 122 runners took part in this race in North Cork, held on Easter Monday. Well done to Denis Carroll, the only Eagle participant, who was 1st M 55 home on the day. Very well done to club member Vivian Foley who ran the 2017 Boston Marathon in a new personal best time of 2h 48m 41s. This 5k race took place in Youghal on Thursday evening. Well done to John Quigley who was 3rd M 60 over the line. Well done to Richard Piotrowski on his category win last Sunday in Kent. Richard finished first M70, running an excellent 43:08 in warm weather conditions. The race entailed 4 laps of a 2.5km loop, and his time saw Richard finish 43rd place overall out of 108 runners. 46 Derry CASEY 36:04 VM40-44 39.00 % M 23 Eagle A.C.
4 Joe MURPHY 22:49 VM60-64 70.93 % M 4 Eagle A.C.
15 Pat TWOMEY 23:05 VM65-69 73.36 % M 14 Eagle A.C. 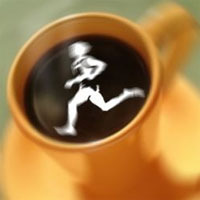 The final race of our club 3km series was held on Tuesday April 11th, with 18 runners. Over the 5 races, over 60 members availed of the opportunity to take part in at least one race, with many completing several. 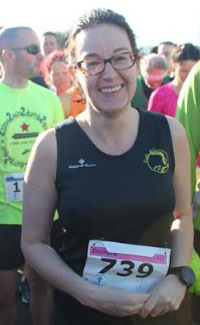 Well done to Geraldine Corcoran who took part in all five races, our only member to do so. 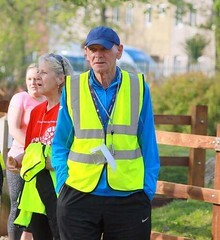 Thanks to John Desmond for co-ordinating the races, to Pat Murphy for doing the timing, and to all the others who helped out at various races since last October. The 2017 Rotterdam Marathon in the Netherlands was held on Sunday the 9th of April and attracted a large field of about 15,450 runners. This is one of the fastest courses in Europe and we had 10 Eagles take part. Well done to all, several PB’s registered and a stunning 2:50:28 for Pat O’Connor. Meanwhile in Paris, on the same day we had three members take on the Marathon distance in very warm and humid conditions. Well done to all three. 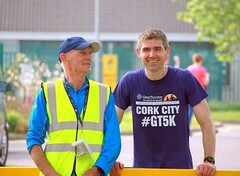 Just over 600 runners took part in this year’s Great Island race in Cobh with 421 in the 10 mile and 184 in the 4 mile. 13 Eagles went in the 10 mile, with some performing pacing duties. Well done to all with a top 10 finish for Colin O’Herlihy Frances O’Connor picking up 2nd F55. Congratulations to Austin on 3rd place and to John Paul on 6th . Congratulations to John Paul on his 4th place in this ultra and then followed up by his performance last Sunday in the Glen of Aherlow. With no club participation in the previous two MMRA races, it was good to see Eagle AC involved in Sunday’s Claragh Mountain 7 K Millstreet. 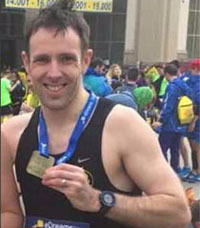 And it was a particularly good to see Denis Carroll running in what is only his second hill race – his first trail race was in Claragh in 2016. Denis had already run in the BHAA 6 mile race earlier that morning, taking 2nd O/55, so his good performance was all the more impressive. 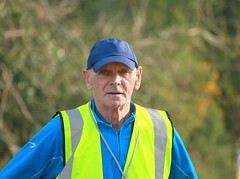 Congratulations to Pat O Connor, 3rd man home overall in Ballincollig on Saturday. Pat Twomey continues his tour of South Australia running in Christies Beach park run this week ! 11 Pat Twomey 23.13 VM 65-69 M 11 15 Eagle AC First Timer ! 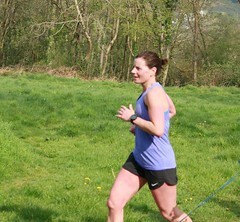 Well done to Adelle 6th lady home over a very hilly course in Wicklow last Sunday.